Ah, spring! 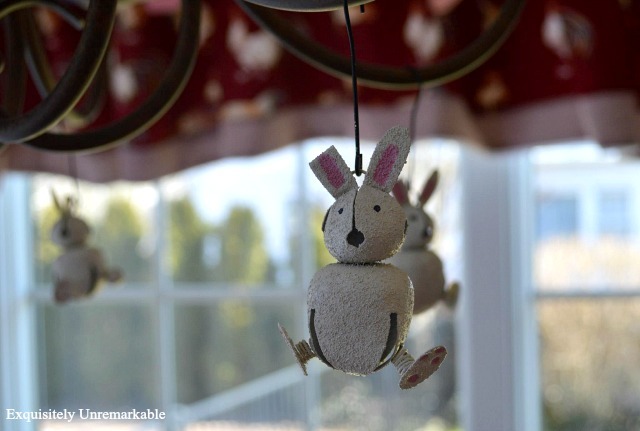 That fabulous time of the year when the world begins to awaken, the ground thaws, birds return and everyone is thinking about bunnies and Easter decor. Or not so much, depending on where you live. I live in a not so much kind of area. Snow can be a staple around here until mid-April. No joke. 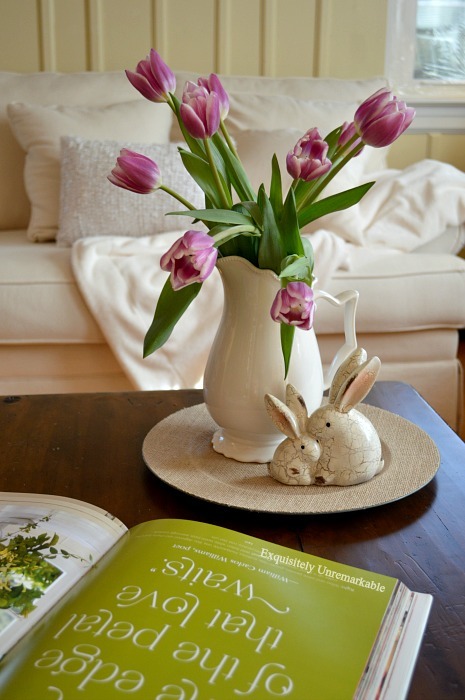 So, if I want to see bunnies and gorgeous pastel spring colors, I have to set them out in my home. 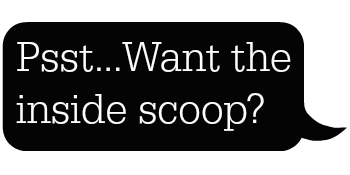 It's a very deliberate act that is often hard to get excited about while I am wearing a heavy winter coat and warm boots, dodging piles of ice and rock salt. However, in the spirit of the season, I have managed to set out a few Easter items this year and if you don't look out the windows, you might be fooled into thinking it was green and there were baby bunnies on the lawn...eating clover...in the warm sunshine...next to the blooming tulips and lilacs...under a rainbow. In all seriousness, when it comes to Easter decor, I make it all very easy. I am still enjoying the clean look of my home now that the Christmas decorations have come down. I'm not ready to fill it up again with a lot of stuff. Simple is the name of my Easter game. 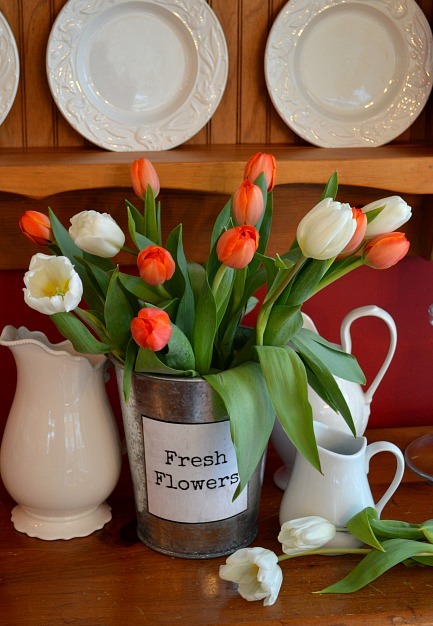 I add a lot of tulips to my white pitchers and pepper them about the house. 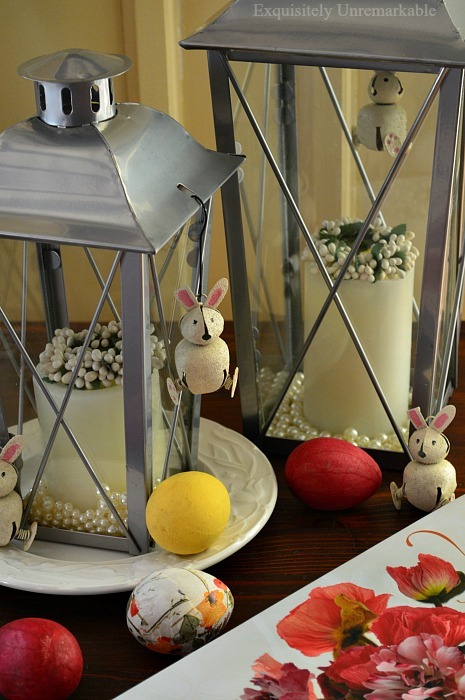 They are cheap and they invoke the feeling of Easter when set next to a bunny or two. I also whip out my jingle bell bunnies. Are they not the cutest things you have ever seen? I found them in a shop years ago, for like a buck apiece. They were too darling to pass up. Each year, I find a new place to feature them. Since we're trying to use the living room more, that's where you'll find them this year. Those are my Easter staples. A few bunnies and grocery store tulips. Of course, it wouldn't be a holiday without a little crafty DIY, so here's a recap of what I have whipped up in the past. You'll get the sense that I am super low key about it all. Like...coloring eggs is not my favorite. It's messy and the kids are bored of it, so when they suggested coloring cookies instead one year, I said awesome...have it. Just don't involve me. They didn't and the results were fantastic. Much better than when I tried to decoupage eggs. The end result is pretty, but the process was not. I thought decoupage was supposed to be foolproof. At least not for this fool. The kids were much more successful with their own easy Easter crafts. They came up with some fabulous ideas and some really sweet cupcakes. Maybe I should just hand this holiday over to them. 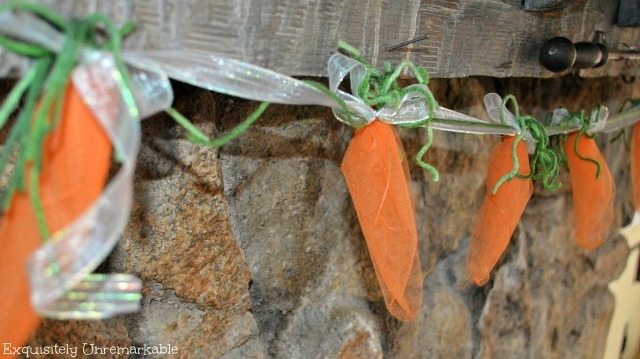 I had better luck with my tulle carrot banner. 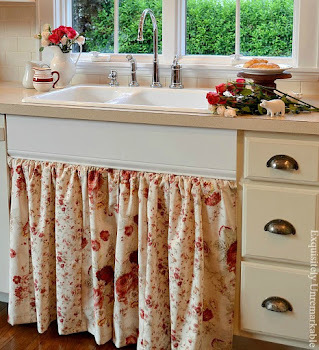 It was super simple to do and I still love the whimsy and softness it adds to my home. Better yet, no eggs, no decoupage. Clearly, I should stick to banners. I have a small addiction, I know. That's ok. Banners are pretty innocuous. 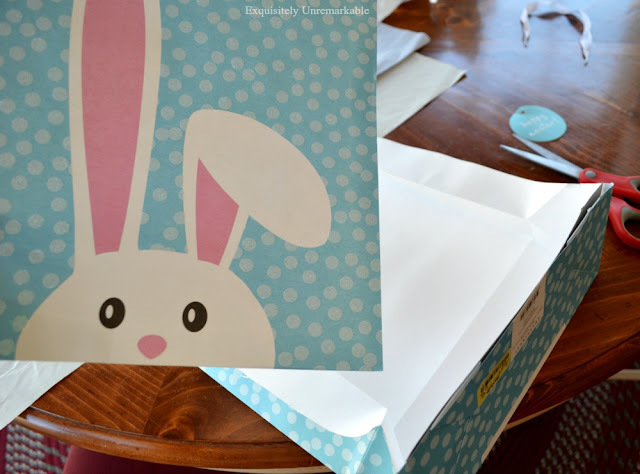 But bunnies and carrots and envelopes...oh my! I love this one and it was made with leftovers from my craft cabinet. 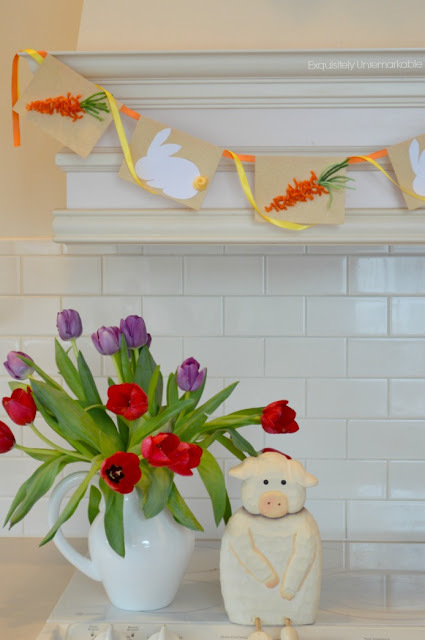 It's just one little accent in my kitchen, but it makes a big Easter statement. Of course, I have to decorate the front door, too. This charming boy was just too cute to leave at the store. Now he lives with me and welcomes guests to my home. See? I told you, low key Easter decor. Super simple and not a lot of it, but enough to acknowledge and celebrate the day without the big expense or set up and clean up fuss. And, in case you think that I am an Easter humbug, I'd like to leave you with this silly story about a pretty normal Easter holiday at my house. Trust me, I'm all in. Just not so much with the decor. 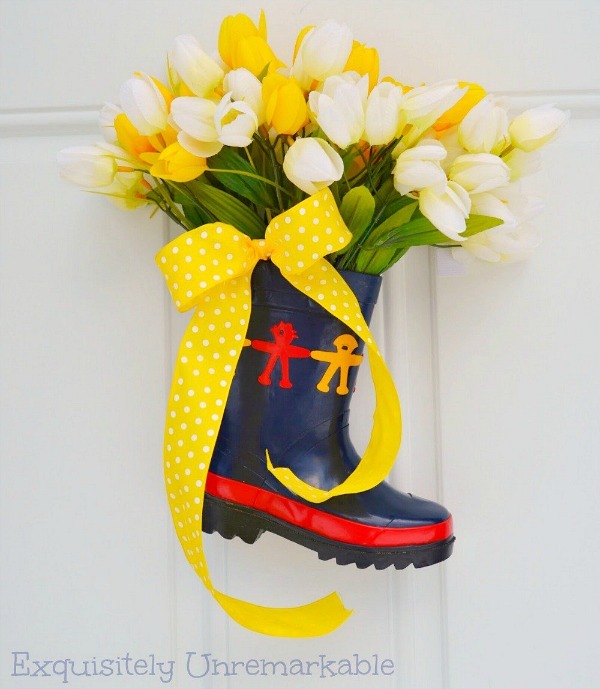 Looking for more tulip decor? I've got that! Your Easter stuff is too cute. Love your banners. 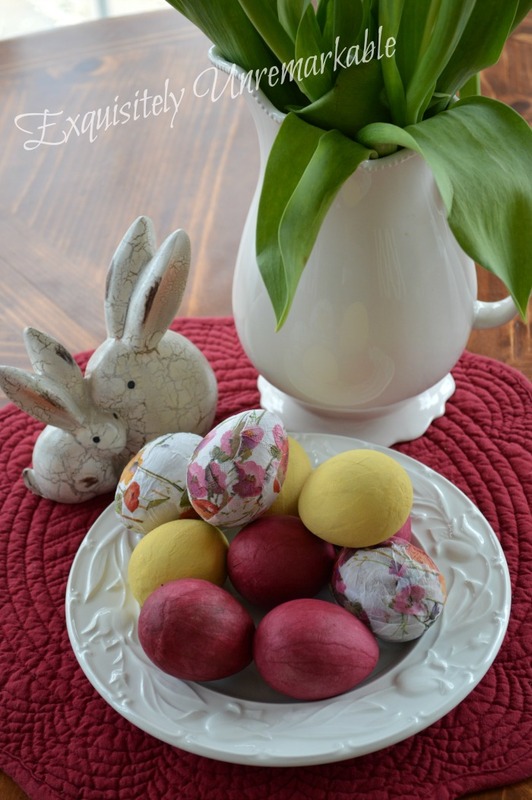 Last year was the first that i had done any decorating for Easter in many years and it was only the table. I will have to get a little bit more out this year. My mom is a holiday decorator. The gene must have skipped me. 60 degrees yesterday and today. I know it probably won't last but it was pretty nice. Thanks Stacey!! :) And I say buy the eggs!! I love your Easter decor. How adorable are those metal bunnies and the carrot garland. It's fun to see what you have been up too. Your simple décor is perfect. Love your jingle bell bunnies and your banners are adorable. I just started decorating for Spring yesterday, after I took the winter décor after my front porch! A few bunnies here and there is all I do. I think I will have to get some tulips.....they are the only flowers that don't make me sneeze! They do say SPRING! I agree, AnnMarie!! Tulips are my safe flower. Most spring flowers, especially lilacs, lilies and daffodils send me running for the tissue box, too. Happy spring porch decorating...what a fun time of year! Thank you, Nancy! I actually really enjoy looking at the eggs, I just never want to make them again. ;) Hugs. I love your sweet Easter decor! And I'm totally clicking over to that colored cookie post. Yum! I never really was that into coloring eggs either. It's so messy and I always made the boys do it outside on our "craft" table. (same thing with carving pumpkins) Lol! By the way, I loved your description of the bunnies eating clover by the tulips and the rainbow...it sounded just like a wonderful children's book! Those banners are great! I am more low key for Easter. We do eggs - the kids still love them, and at age 14 and 11 I don't have to do much. I do love to do flowers, too, and that's my main Easter decor! Flowers are always awesome, Deanna, I agree! :) Have fun with those eggs! Love the banners, you are a banner master! Love that cute banner, Kim...you always have such cute ones! 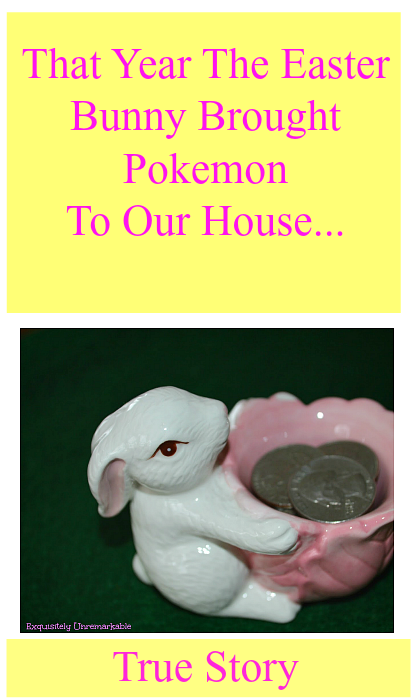 Had to laugh at your comment about imagining bunnies in your yard. They are all happily hopping in our neighborhood...Jackrabbits, that is! I'm not sure why they are so prolific this year. Maybe it was all the rain and very chilly weather just kept them in their dens doing what bunnies are want to do! Tulips in all colors spruce it up around here . . .
and I call it good . . .
Oh...hand blown eggs! I need some! You decorate more than I do. I put out two bunnies and a little Happy Easter sign lol I am in love with your bunnies though. That’s a perfect description, Poppy, quiet glamour…they certainly do! I would say you are definitely ready for the Easter Bunny! Such cute decorations. I absolutely adore them, Deb! Jingle jingle! The tulips are beautiful Kim and the little bunnies are so sweet. I like your eggs too but I have never been brave enough to try! Tulips make such a big diffeence for me as well. It like a passage out of Winter, Spring comes so very late here so having the fresh living blossoms help with the wait. They certainly do Leanna! I crave color and the tulips fit the bill!